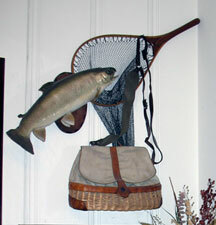 An example of how to create an area displaying a Creel, Net and Mount combination. Click image to see an enlarged photo. Note: Items not for sale, display only. VINTAGE ORVIS CENTER HOLE WICKER CREEL! Scarce vintage fishing creel that was produced exclusively for the famous Sporting Goods Company in Vermont "Orvis". This whole wicker, center hole creel was in their 1950's catalog. It retains all its original wicker construction, lid hinges and front leather closing strap. The closing strap and its' buckle are still intack. Found with its original thin style leather shoulder harness. This creel model can be seen in the collectors book "Art of the Creel" which we also sale. It measures approximately 14" across, 6 1/2" front to back and 8 1/2" high. It has a beautiful woven "overlap" top lid design with a turn of the century center hole configuration. Honestly used with minor repair near top center hole opening (very minor & doesn't effect display). Please click on its image for additional closeups! Very large old French or Adirondack Center Hole Creel woven of whole wicker strands and retaining its original canvass shoulder strap and front closing wicker latch! This creels measures an impressive 16" wide across its belly and 11" tall at the back. It is also approximately 12" deep! The entire creel appears to be in great condition with no visible problems. Displays beautifully! Please click on its image for additional closeups and views! Large 16" early French weave split willow creel in excellent condition! This is a fine example of the early creels imported to the United States Tackle Shops pre-leather trim. It is also an example of the tightly woven creels that the famous Oregon Creel makers imported and then dressed with their fancy tooled leather. This creel measures approximately 16" across its bottom and 10" high at its back! Makes a great addition to any collection or as a display artifact for cabin, lodge, or home. The lid closure is not intact. There was no harness found with it and the harness were after-market purchases if desired. Please click on its image to see additional closeups! BEAUTIFUL SIZE 14 TIGHT SPLIT WILLOW CREEL W/LEATHER TRIM & HARNESS! Great condition vintage tight split willow creel with vertical leather trim on front! This creel is approximately 14" wide across its bottom. It has its original rear carry handle and front closing strap and buckle. Made in Japan for the American Tackle shops as were 98% of all creels since the early 1900's including the baskets that the famous Oregon Creel makers used to dress with their fancy tooled saddle leather. It was found with a new old stock (unused) shoulder harness which was always a "after market" purchase and it is included! Nice addition to any collection or perfect to display in home, cabin, or lodge! Please click on its image to see additional closeups! Mint/unused 14" split willow creel by Oregon maker A.E. Nelson. Pictures tell whole story...never used, beautifully tooled and including a high quality padded harness by Nelson too! They don't get any better then this! Signed on back A.E. Nelson in leather. Please click on its image for additional close ups! RARE "RAINBOW" MODEL CREEL BY THE GEORGE LAWRENCE CO. Very rare leathered creel by the George Lawrence Co. of Portland, Oregon known as their "Rainbow" model 304 with double front accessory pockets, half leathered top, and leather trim. The other feature is that this model was made from Cordovan leather (horse hide rather then cow hide). The Rainbow model had plenty of leather trim but no embossing! This No.304 was the starting size of the 3 sizes made (304, 305, & 306) and was 15" with a capacity of 25 lbs. It retains its original rear carry handle and front closing strap for the lid top. This creel has a shoulder harness and is in overall great condition! There are marks and nicks here & there but nothing that really takes away from displaying this creel as a highly prized piece of your collection! Please click on its images to see additional closeups!